The English speaking world has seen the introduction of many Englishes over the years; from the original imposter – American English to the new kids on the block like Hinglish, all of them have changed English to some extent or the other. However, linguistics have recently discovered a strain of English which is so revolutionary and so radical that its promises to shake up the English speaking world. They call the new strain: “Inglish” or Inzamam’s English named after its founder, Inzamam-ul-Haq, former Captain of the Pakistan Cricket team. "Inshallah, pitch bad…umm...boys played .. umm … badly… Ireland good … bahuth shukriya." 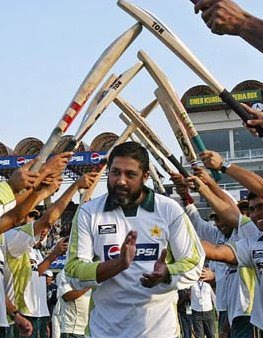 Using a total of only 10 words (not counting the umms) Inzamam had described a World Cup ODI defeat to Ireland! Amazing! Linguists say the secret behind Inglish is the use of what are called Keywords™. Instead of labouring on with superfluous words like prepositions, conjunction, articles etc, Inglish™ uses the Keywords™ present in the idea to get right to the point. Avid cricket fan Ravi Kumar, says the speech moved something deep inside of him. “The brevity and in spite of the brevity, the eloquence leaves you spell bound,” says Ravi, in obvious awe of Inglish™. In spite of inventing a form of English, Inzy remains a pucca Pakistani at heart. 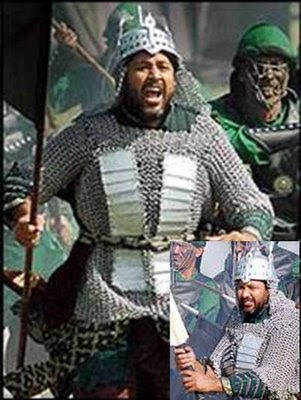 He is seen above playing a popular Pakistani folk game - War. And they are both in the ICL too! hehe..nice 1 hades, Inzy seems to have inspired a number of his fellow Pakistani comrades, but on a serious note they oughta go for one of those spoken English courses like waqar younis n ramiz did. How can you forget Shoaib Akhtar? Lolz @ Tip-top spoken english course, thanks to which the Rawalpindi Express (am not using the first name cuz things might get a bit ambiguous :D) looks very much on his way to bag a bollywood ticket if not a position in the national side. American athletes use the same "keyword™" approach in their interviews too! Yes, but how to make fun of people who win as many Golds as these inscrutable Americans ? Phelps has more gold medals than India will win in the next 300 years...ok maybe even 400.